I am running in the NYC | Christie O.
I no longer believe in waiting to check off items off the bucket list and yes I believe that everyone should have one. Why? Because I get, we get, one shot and I want to do it all while I’m here, all of it. Every last drop of it. I wrote a little bit about this on the Facebook on my third cansuh-versary which just passed and I suppose it’s partly the realization that the cansuh can give you that time is limited (or not but who knows and the ‘who knows’ part is the important part) but mainly I just believe it’s simply me getting old and reaching 40 soon and being a full and capable adult who has never felt more confident about making adult decisions than this moment in time. I tell ya, if getting older teaches you one thing, it’s to care less about the crap and care more about the important stuff and for me, doing stuff you love and dream about with the people you love is the important stuff. And running the NYC Marathon is on my to-do list and has been for a long time and I know I aint gonna qualify for it, that’s just the way things are. I tried for the lottery but I wasn’t picked this year, so instead of waiting until next year or until the “time is right,” whenever that is, I signed up to run the marathon through a charity with my favorite running buddy Nicole and we are going to New York this fall! Hurrah! So I would love your support as I train for this amazing opportunity to run through all the boroughs of a town I love with my whole being and raise money for running opportunities for children through the charity Team for Kids. Here is the link to sponsor me on my journey: http://runwithtfk.org/Profile/PublicPage/21231. I would love it so much! This week is my first official training week. Nicole and I joined the run group RunVie Racing here (it was my Mother’s Day present actually) and I have a training plan and everything and I’m going to get back to weekly training updates on how it’s going. Right now I am freshly showered in my wizard robe after our first Thursday night track workout. It was 90 degrees and somewhat painful like track workouts are, even though it was only 3 miles. Sunday, we ran 4 miles, on Tuesday night we ran hill repeats the day after I did legs by the way (??! !^%^*&& and other words), and Wednesday I ran 3 on the treadmill while watching McFarland USA. Ohmigod have you seen it? It’s amazing and fittingly run-inspiring. Watch it, especially if you’re looking for something to watch on the treadmill like I was. This is Nicole and I. Whenever we take pictures together, my face is so much bigger than hers. Why is that? Also I am doing Piyo in between for strength workouts and currently I am sore all over. This year, I have committed to do a race a month in 2015 and so far so good! 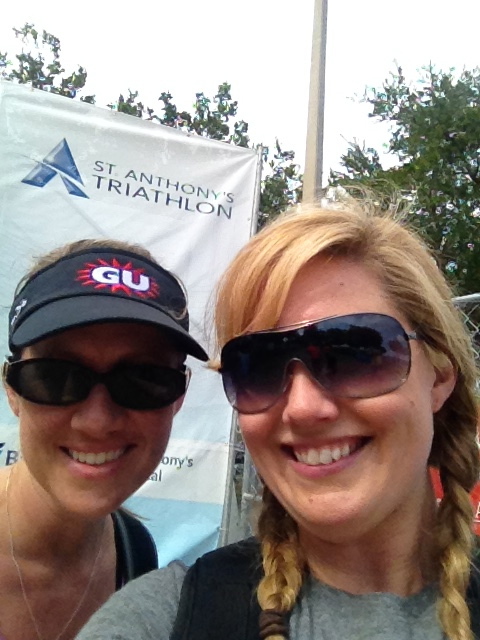 The biggest race I did so far was St. Anthony’s in April and it went just kind of okay. It’s the most I’ve forced myself to train in the past two and a half years that I’ve been back to work, so that is my cup half full about this race. But it’s still not as much training as I used to do in the olden days. Boy did I have a lot more time back then, even though I still felt like I had none. It was luxurious. Now I really have none and I’m nipping and tucking and carving spots of time out of my day like a mo-fo. I mean, this stuff REALLY HAS TO GET SCHEDULED! And sometimes in the dark! But let’s face it, if we’re friends on Facebook, then you know the past four weeks have been madness, my mom was in the hospital (update: she is out and recovering! ), school’s out for summer, and I have changed jobs. In my world, and probably yours too, all the things have to happen at once. All the things. It just is not life when things go nicely one at a time and everything takes its turn. No. Everything.at.once. But that also meant that something had to give and I traded in my workouts for chicken nuggets, pizza, and ice cream, sometimes all in the same day (sometimes all in the same meal!) These were not some of my finer moments. Apparently I eat my emotions. And I don’t really think I have ever drank this much coffee in my life either. I went days without sleeping (oh and yes right now the kids are taking turns being sick too). So until this week, I have done nothing for the past four weeks. Zip. Nothing! But I am not beating myself up over it, I am simply moving on. Life throws curve balls and it’s no secret I could use some work in dealing with it, but right now I am looking forward to training for this marathon, to working toward my dual goals of getting back into shape and running through New York City in November and to eating the good stuff. Oh! And by the way if you are on Twitter & Periscope, you can follow me there! I am @christieo & Christie O. on Periscope. I am fascinated and in love with Periscope right now. I just watched Jim Gaffigan getting on the airplane and some random girl opening packages. This, my friends, is the future. So Monday is the day I start my new adventure at my new job and it will be week two of marathon training. I have a long run on Saturday, which right now is 5 miles. And this has turned into a long post. What is your weakness when life throws you curveballs? And are you training for anything right now? Hit me up in the comments below!